Packing curtains presents some interesting challenges. To get these ones down takes three people, ideally. Textiles are fragile, and when stored for a few months any creases will stay and possibly get worse, so the team must work to minimise damage. The curtains need to be laid flat, and finding the space to do so in a house like this can be a real problem! They must be put down on a clean surface, so protective sheets are laid out for them to be put onto. The top part of the curtain is the most difficult to deal with and the team uses acid-free tissue puff ‘jellyfish’ around the top to minimise creases in the gathers. Any metal fixtures must also be isolated with tissue. Ideally, textiles should not be folded, but sometimes they have to be because of space issues. When this is the case, every fold must be padded out. The team make ‘sausages’ using wadding or bubble wrap, which are themselves wrapped in conservation-friendly acid-free tissue paper, to make a smooth surface that won’t abrade the textile fabric. The curtains are then wrapped as a ‘massive parcel’, in Project House Steward Fern’s words, using Tyvek, which is a conservation-grade material of polyethylene spun-bonded into a fabric, and is very strong and dust-proof. 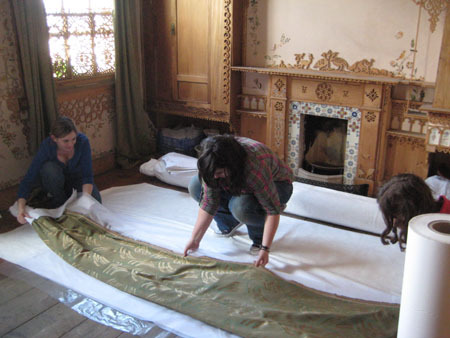 After being labelled, the curtains are carried as flat as possible out of the house, a task which again takes three people and is rather a challenge to take downstairs. Good luck, guys!